HOP HOP Banki (Bubbles) is a unique educational toy. TUBAN, being a specialist in soap bubbles, has prepared a set making it possible to enchant without knowing magic. Everybody knows that trying to grab a soap bubble results in breaking it irretrievably. 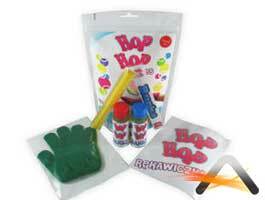 A HOP HOP Banki set allows you to retain a bubble for a longer time, grab it, turn it, squash it, twist it, flick it up and juggle it... It can all be done thanks to a magic glove and essential accessories.